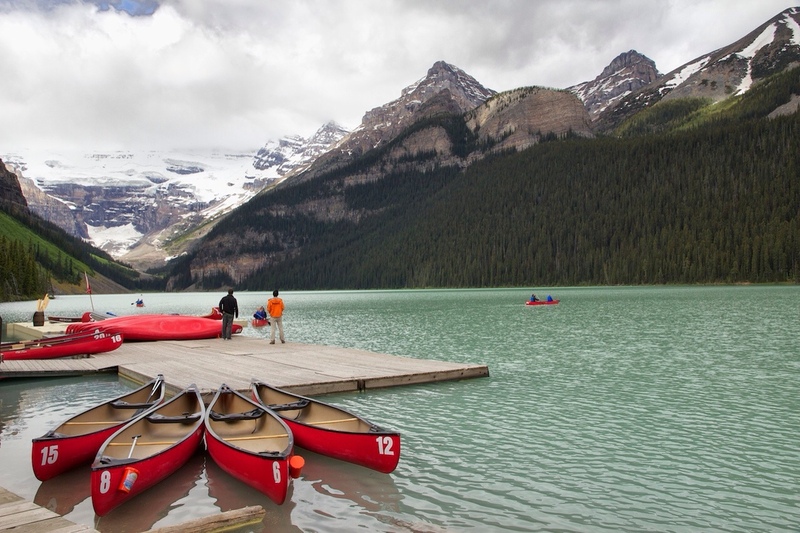 Lake louise, high in the Canadian Rockies is lovely. It hasn’t totally stopped raining, but after our rainy adventure in Banff we will take any sun we can get. After the mudslide was cleared we were able to move the 35 or so miles north from our campground in Banff to our new location in Lake Louise. Not everyone was as lucky, the road to Calgary was wiped out and is still not open. The scenery continues to impress. Snow capped peaks tower over milky blue-green lakes and rivers. Glaciers abound. 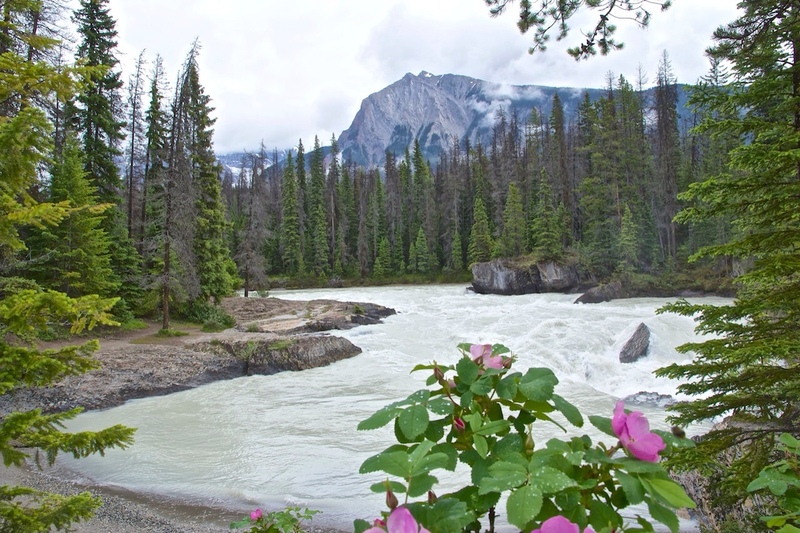 It is the grinding of these glaciers against the mountain rocks that creates the fine powdered silt or “rock flour” that is swept into the water by rain and runoff. These fine particles are suspended in the water and reflect the sun, giving the rivers and lakes their luscious hue. When it was sunny (and sometimes when it was not) we toured the the area and have yet to agree on which lake we liked best, they are all amazing. With all this water one would think the fishing would be grand, in fact, we counted on it and planned extra time here to catch some fine trout. Well, with the rain the rivers were high and fast and dirty, not good for fishing. The lakes were also high, but the wind and cold was more a limiting factor there. (Temperatures have ranged from the high 40s to the low 60s) The bottom line was we were unable to do much fishing, so we did extra sightseeing. 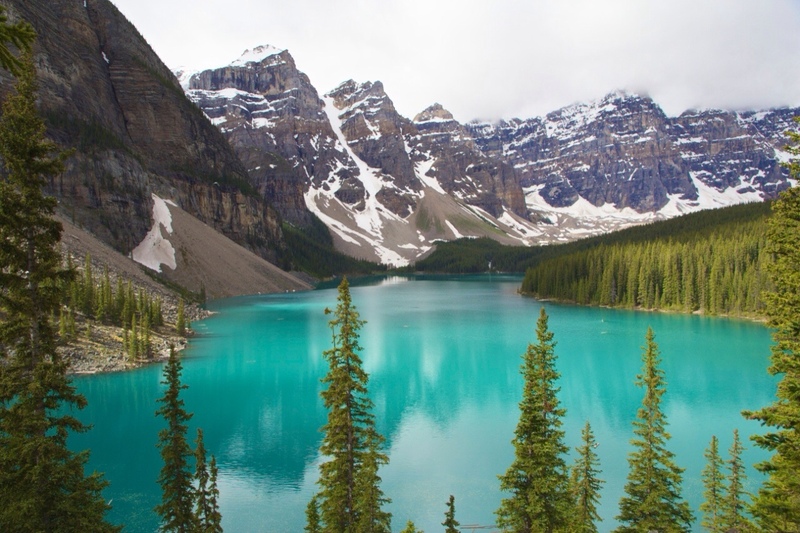 Bow lake, Moraine Lake, Emerald lake and Kicking Horse River in Yoho National Park, Peyto lake were among the many sites visited. The view of Peyto Lake is from Bow summit, the highest point on the highway, at 6785 feet. 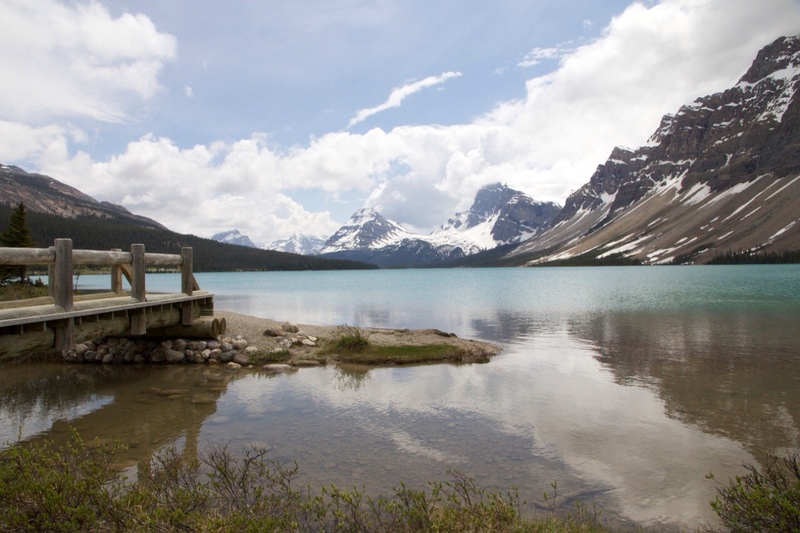 Lake Louise itself boasts Victoria Glacier, which stretches almost down to the water. 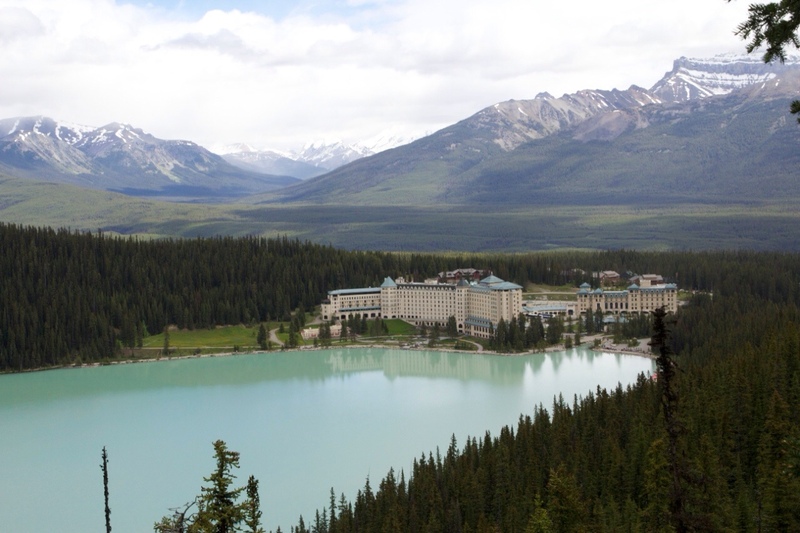 It also has the imposing hotel, Chateau Lake Louise. It was first built in 1894, by the Canadian Pacific Railroad, when they were trying to come up with ways to pay for the rail and selling the scenery was a logical choice. “Since we can’t export the scenery, we’ll import the tourists” was their motto. Of course the current ‘chateau’ is quite a bit bigger than the original wooden hotel, but there are a lot more tourists as well. Tomorrow we drive north on the Icefields Parkway, a 143 mile scenic highway through the heart of the Rockies, to Jasper National Park. We are hoping for warmer, sunnier weather, more beautiful scenery and better fishing. Time will tell. Beautiful photos of spectacular scenery! Wow, its just never ending spectacular vistas when you visit up north. Great captures. The photos of the area are beautiful! 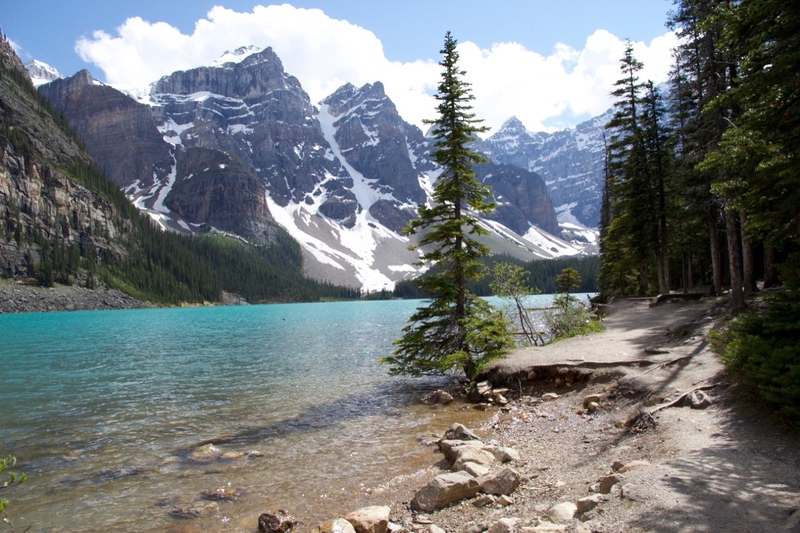 Love the Moraine Lake scene. Spectacular! So happy I can live large through your beautiful photos and lovely prose 🙂 Missing you here–rainy and HOT! Hi Judy and Rich, just caught up with your travels. In spite of the rain your travels are through beautiful countryside. I hope the sun shines for you. Enjoy! Enjoy your beautiful surroundings and travel safely!